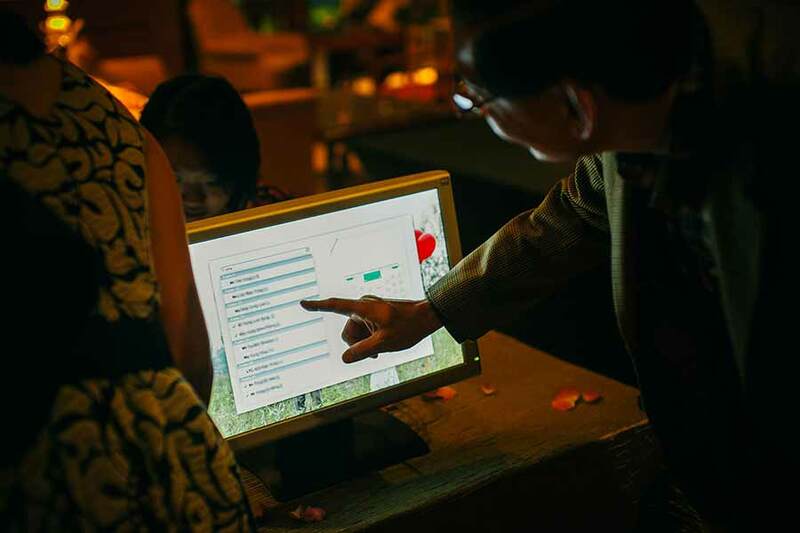 GuestDay is a stylish iPad-based guest reception system for weddings, company dinners, conferences, and other events. Why do I need GuestDay? No more printed guest lists, flustered receptionists, and long lines at your reception counter — GuestDay makes life easy for you and your guests, while looking fantastic in any setting. As the event organiser, you&apos;ll find GuestDay's automatic attendee syncing invaluable, as you can see total attendee figures at a glance from any iPad. What do I need for GuestDay? 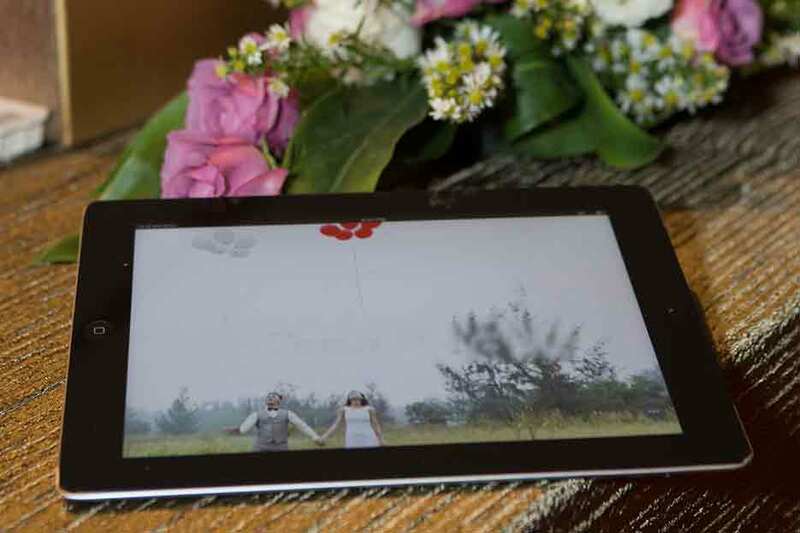 Before the event, prepare the guest list (in Excel or CSV format), table layout (PDF), and some photos (high-resolution JPG or PNG) for the welcome screen. You can send these to us by email — we&apos;ll be in touch to ensure everything goes well. Do you provide reception services? Yes, for corporate events. However, we designed the app so that it&apos;s intuitive and easy to use, so anyone who&apos;s familiar with using smartphones should have no trouble using it. We&apos;ve even seen guests check themselves in without the help of receptionists! After you sign up, we&apos;ll guide you through the entire setup process. All you need are to prepare the material (guest list, table layout, and photos), and be in touch by email for further instructions. On the day of the event, you (or a receptionist) should be around to receive and return the iPads and other equipment. When we get there, we&apos;ll also provide a quick run-through on how to use the app. Will I be able to make changes to the guest list before the event? Yes! We know these things will change quickly. You can make changes up to the day before your event; during the event, we&apos;ll let your receptionists know how to modify the guest list. I have 100/200/1,000 guests. How many iPads do I need? 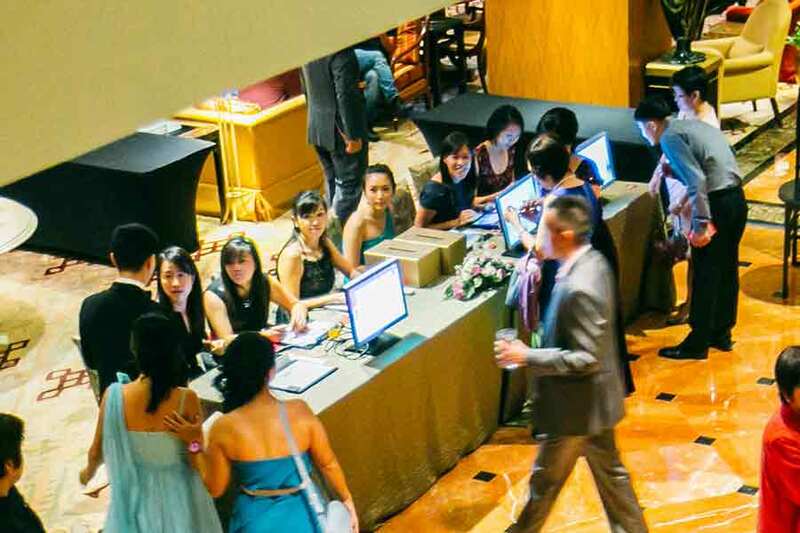 From experience, we recommend 1 iPad per 100-150 guests to register guests quickly, although this depends on the layout of the reception area. In addition, you can add more iPads if you are expecting more guests. When you sign up, we&apos;ll advise based on your event location and the number of guests. The barcode scanning option can help speed up registration. Does GuestDay display guest names in international characters, such as Chinese? Yes. In order for guests or receptionists to search for these names, we&apos;ll enable the respective iPad keyboard. You can also add pronunciation guides, e.g. pinyin, that are searchable but not displayed. However, on-screen instructions are only available in English. Can I make adjustments to guest information during the event? Yes, you can do so on your own using the in-app administration panel, which allows you to add and edit guests and tables. After you&apos;re done editing on one iPad, these changes will sync to all other iPads. What are the monitors for? Each monitor will provide a larger display for the iPad it is connected to. In such a setup, receptionists use iPads to search for the guests or scan barcodes, and guests see their information show up on the monitors. Of course, GuestDay works well without monitors, in case your guests forget to bring their barcodes — receptionists show the iPads to the guests directly, or ask guests to type in their names. How many monitors can I rent? You can rent up to the number of iPads you have, as each monitor will be connected to an iPad. You could also set up a few monitors at your main counter, and have the other iPads brought around the room to act as mobile reception terminals. Send barcodes to your guests with your invite cards, and they can check in even faster — no need to search, just wave the bar codes in front of the iPad cameras. How does the barcode scanning process work? Before the event, we will work with you to generate barcodes for your guests in soft-copy, which you can print and send to your guests with your event invite. 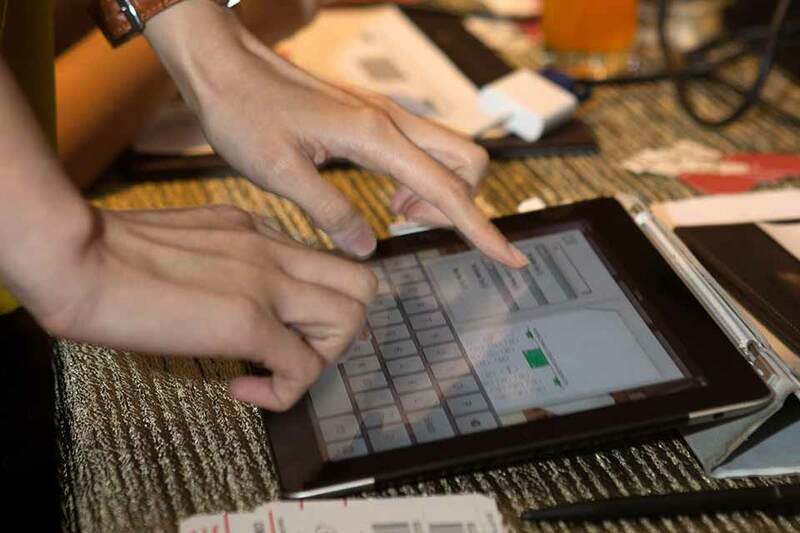 When guests arrive for registration, they can scan their barcodes using the iPad camera. Guests who forget to bring their barcodes can be registered using their names. What do the barcodes look like? We provide barcodes in a few templates for you to choose from. You can customise the text and background for these templates. How do I find out more about features for events, such as name badge printing? We&apos;d be happy to share more about these features! Read about all the features on our events page, and get in touch to find out more. You can contact us through our signup page, or drop us an email at hello@guestday.com. Is GuestDay meant only for weddings? No, we&apos;ve actually deployed GuestDay for many large corporate events, including annual dinners, gift redemptions, and conferences. Email us and let us know about your event. Can I test GuestDay out? Please email us and let us know your requirements, and we will try to answer your questions, or arrange for a video demonstration. Our promotional video also shows GuestDay in action at a wedding reception. Is GuestDay available for download on the App Store? We do not currently offer GuestDay on the App Store. We recommend using our own iPads instead of trying to download and set up an app. 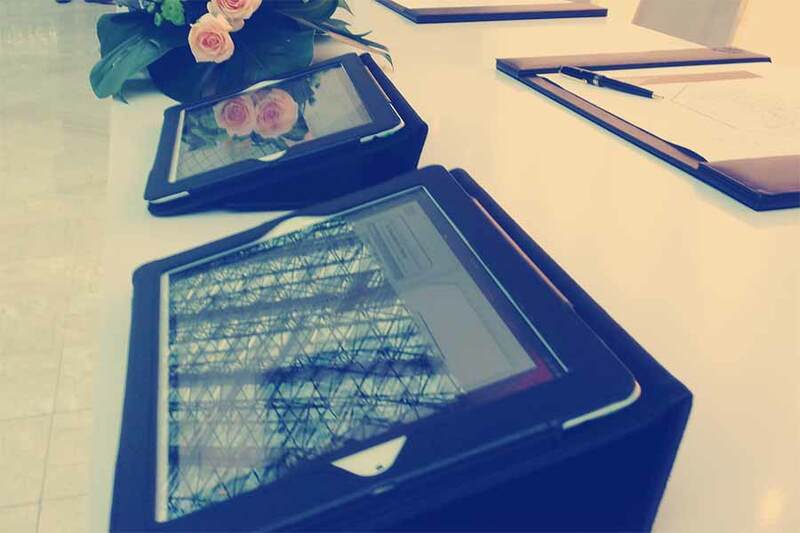 This is because we&apos;ll provide the iPads fully-charged, fully-set up with your event information, and prepared with foldable covers and mobile data. Do my venue need to provide wi-fi to use GuestDay? No, our iPads will come with their own mobile data plans, and the app will continue to register guests if syncing stops for any reason—once the app is back online, everything will start syncing again. My question isn&apos;t addressed here. If there&apos;s anything else we can help you with, please send us a message using the form on our signup page, or drop us an email at hello@guestday.com. Got all your questions answered? © 2019 Tinkertanker Pte. Ltd. GuestDay is a Tinkertanker production from sunny Singapore. Registering guests in style since 2009! We also teach programming and electronics, and curate tech toys & tools for sale.